Fresh corn cobs lend wonderful flavor to this summertime favorite. Work over a large bowl or bundt pan to catch all the kernels as they fly! Chef’s tip: simmer the stripped cobs in the soup for extra corn flavor. Remove cobs before pureeing. Working over a large bowl, use a sharp serrated knife to cut off the kernels from each ear of corn. Then scrape down the cob with the knife to bring out the extra creaminess from the corn. Set aside. In a large soup pot or Dutch oven, melt butter and sauté onion over medium heat until translucent (about 5 minutes). Add celery, potatoes and salt, and sauté another 5 minutes. Add stock or water and bring to a boil. Lower heat to a simmer and cook covered for about 10 minutes or until potato is tender but not mushy. Add corn kernels and spices and simmer covered for another 5-10 minutes. Transfer about 1/2 to 2/3 of the soup to a blender or food processor. Puree until smooth, then return pureed soup to the pot. Add milk to the soup and stir to blend. Heat gently over a low flame, but do not bring to a boil. Season soup with salt and pepper to taste. 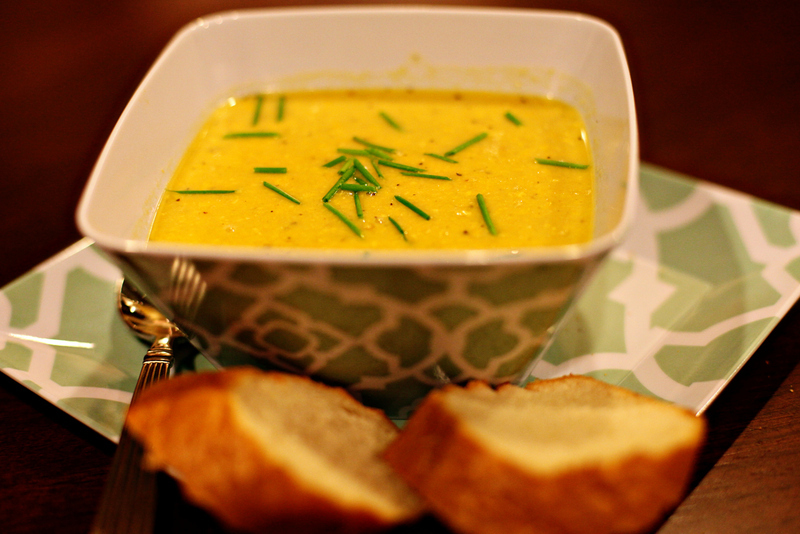 Ladle into soup bowls and serve hot with crusty bread on the side.